The last few weeks have been some of the busiest weeks of any summer I can remember. The pace of them caught off guard, being as how I am back in school now as I continue my studies toward a Licentiate in Canon Law; without classes, summers have always been somewhat quiet. For two and a half weeks I found myself back in Springfield, both to help cover Masses at the Cathedral of the Immaculate Conception while the pastor was away for a vacation and to help with the Catholic Leadership Institute and the Advanced Catholic Training for high school throughout the Diocese. I've been involved with both of these of two programs since I was a seminarian and they are always a joy. Once the two programs were finished I made a brief return to Effingham to visit several friends over the course of a couple of days. I then returned to Quincy for a day and now find myself sitting at a dining room table in Mililani on the island of Oahu. I have returned to Hawai'i for a vacation of my own and will be here until August 24th. My class schedule now allows me to take such an extended time all at once, which I was hoping would allow lengthy visits with many of my Hawaiian friends whom I do not get to see often enough and also a good period of rest. As is often the case, though, the Lord seems to have had something else in mind. Two weeks ago, as I returned to Quincy to Springfield for the funeral a cousin, I received a call from His Excellency, the Most Reverend Clarence "Larry" Silva, Bishop of Honolulu, who called with a question to ask me. He explained that the pastor of St. Michael the Archangel parish (which has four missions) on the Big Island is in great need of a time of rest himself, that the Bishop cannot send another priest to assist him until September, and asked if I would be willing to give him my assistance while I am in Hawaii. Having never been to the Big Island and not knowing anyone there - and because my summer hasn't been too restful thus far - I was hesitant to accept his invitation and asked for a few days to consider it and to look into changing some plans already made on Oahu. The more I thought about it, I did not really have a good reason to say no and so offered to assist the pastor from August 6th through the 20th. This would allow me to give him a hand while also allowing me some time to visit with my friends on Oahu. 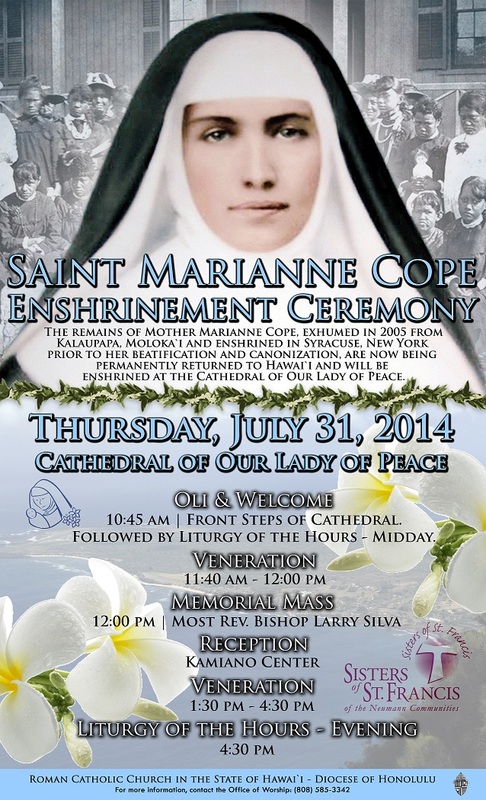 It will allow me to concelebrate tomorrow's Mass as the relics of Saint Marianne Cope are installed in the Cathedral Basilica of Our Lady of Peace, to which I am very much looking forward. Just a few minutes ago, we collected our various intentions together and presented them to the Father, praying the Lord to “increase the gifts of [his] grace” so that, we, his servants would be “ever watchful in keeping [his] commands.” What, then, are the gifts of his grace, and what are his commands? You shall love the Lord, your God, with all your heart, with all your soul, and with all your mind. This is the greatest and the first commandment. The second is like it: You shall love your neighbor as yourself. The whole law and the prophets depend on these two commandments (Matthew 22:37-40). To love God is to honor him as is fitting for the creature to worship the Creator. To love our neighbors is to desire and to work for what is for their true and lasting good. It is as simple as that. We might say that the gifts of his grace might also be simply summarized in one principle gift, a gift named in the final line from the first reading, the “repentance of sins” (Wisdom 12:19). The reality of sin and the consequences of sin have fallen somewhat out of fashion in recent years and some now even deny that any deed or thought could really be sinful. This is due, in no small part, to the subtlety of the Evil One – he sows while men sleep and are not paying attention - and to our own pride (cf. Matthew 13:25). Let me illustrate the Devil’s subtlety with a personal anecdote. One warm summer day, I was returning home from a visit with a few friends (I was dressed in normal people clothes). I stopped at a gas station and, after filling up, went inside the store to pay. As soon as I walked through the door, the cashier said to me, “Will you watch the store? I need to use the restroom?” and with that was gone. The Evil One continually roams the fields of the Father sowing the seeds of his weeds. These weeds grow and seek to intertwine their roots among the roots of the wheat sowed by the Father and slowly poison the wheat. Once poisoned, the wheat produces little or no fruit and is worthless, good only to be collected with “all who cause others to sin and all evildoers” and cast into the fire (Matthew 13:41). It sometimes happens that we give in to the subtlety of the Evil One and accept his lies and do not resist the roots of his weeds; we sometimes live, act, and think more like weeds than like wheat. The roots of his weeds have grown and spread so far that many who think themselves wheat in the Father’s fields no longer acknowledge right and wrong; they do not keep the Father’s commands or, worse yet, do not think them important. In their pride, the false wheat do not acknowledge their own sin, that in their deeds and thoughts, in what they have done and in what they have failed to do, they have fallen short and have not produced the proper fruit. How, then, do we distinguish the true from the false? How do we love truly and authentically? We do so by “be[ing] ready to preserve the grace received from the day of our Baptism, continuing to nourish faith in the Lord that prevents evil from taking root.” It was in Baptism that we rejected Satan and all his works and all his empty promises, yet this rejection must be made again and again throughout our lives. This requires a regular examination of our consciences with one simple question: When did I fail to love today, whether in what I did or in what I did not do? When we begin to ask this question at the end of every day, our sin will be apparent to us and we will have “good ground for hope” because the Lord is “good and forgiving, abounding in kindness to all who call upon [him]” (Wisdom 12:19; Psalm 86:9). Here we see that his kindness requires that we first call upon him, that we acknowledge our sin and pray, “Turn toward me, and have pity on me; give your strength to your servant” (Psalm 86:16). All of this, of course, presupposes that we desire to be “fervent in hope, faith, and charity.” Put another way, it presupposes that the primary goal of our lives is that we grow in holiness, that we be true and faithful friends of Jesus, that we produce much fruit and yield a rich harvest (cf. John 12:24). When we think of growing of holiness, we often grow somewhat ill at ease and uncomfortable because we think it is something beyond us and perhaps not even meant for us. Nothing could be farther from the truth! The Lord desires this for each of us. He desires that we be righteous and “shine like the sun in the kingdom of [our] Father” (Matthew 13:43)! We should not be afraid of holiness or shy away from it; rather, we should desire it with all of our heart! It is only by continual growth in holiness that we will find the satisfaction and fulfilment of our every yearning. Collect for the Sixteenth Sunday in Ordinary Time. Pope Benedict XVI, Homily, 18 April 2005. Pope Benedict XVI, Angelus Address, 17 July 2011. J.R.R. Tolkien, Draft Letter to Eileen Elgar, September 1963. In The Letters of J.R.R. Tolkien: A Selection Edited by Humphrey Carpenter with the Assistance of Christopher Tolkien (Boston: Houghton Mifflin Company, 2000), 326. Four hundred years and four days ago, Saint Camillus de Lellis died in Rome after spending his life in service to the incurably ill. What strikes me most about him is the title of the religious order he founded: the Fathers of a Good Death. Today, if a priest - or anyone else - were to establish an order of the same or a similar name, he would be called "morbid," "sick," "insane," or even "depressed." Rather than acknowledging or accepting the simple and unavoidable fact that each of us will die, we prefer to pretend that we can escape death. We do so principally by not talking or thinking about death, much to our detriment. Saint Camillus and his companions did not shy away from the end of human life as we know it and sought to prepare souls to see the Lord Jesus face to face. What will we do to help prepare ourselves - and others - for this day, which may come tomorrow or forty years from now? A friend asked an intriguing question on Facebook today: "What is one word that you want people to use at your funeral to describe you?" My first answer - and that also of another priest - was that I be said to be dead (priests have an odd sort of humor). In all seriousness, though, the answer to her question can be used as a daily examination conscious and as a way to weigh our priorities. What word would I like to be said of me? What did I do today to make that word true? Now, you ask, what word would I like to be said? It is difficult to choose just one word when three come to mind (though they are somewhat connected together): faithful, loyal, and authentic. Asking this question each day can help us prepare for a happy death and so look with joy upon the Holy Face of him who died for us. The reality of death is a curious thing, for it has the power both to separate us and to bring us together. It was only a few short weeks ago that it brought many of us together in this same church even as it separated us physically from a member of our family; it has done so again today as we pray and mourn at Jeanne’s death. Regardless of whether it is expected or not, death, we know, is never easy. The discomfort it causes – the grief, confusion, and questions it causes – reminds us that death is not part of human nature; it was not part of God’s original plan, but since the Fall of Adam it has entered Creation and makes it effects felt. Each one of us has within us a desire for immortality; we see hints of this desire in our as yet unfulfilled yearnings. It is this hope for immortality with which the souls of the just are full (cf. Wisdom 3:). What is this immortality for which the just hope? It takes only a short period of reflection on life – even with its many joys and pleasures – to know his words are true, that this sort of immortality would be a great burden. This is why J.R.R. Tolkien suggested that death is not simply the Doom of Men, but also the Gift of Men. If this is so, why is the hope of the just full of immortality? The just hope for immortality rightly and properly considered whereas we too often fall into “the hideous peril of confusing true ‘immortality’ with limitless serial longevity.” We do not make the distinction between “Freedom from Time, and clinging to Time.” True immortality, the immortality for which we hope, is not a clinging to time, but a freedom from time. This freedom from time can only be found in one not bound by time, by the One who created Time, by the One who, in the fullness of time, took on our humanity; this freedom from time can only be found in Jesus Christ, in him who has died and yet now lives. So very often in his earthly ministry, Jesus went up the side of a mountain - as he does in today’s Gospel - to teach his disciples. He still sits as a teacher today and teaches us from the mountainside about death and about life. Like so many of his followers before, we have gathered here at this mountain – at this sanctuary of the Lord - with confused emotions and mixed feelings. There is something about Jesus that continually draws us toward him; there is something different about him, about the words he speaks, he teaches with authority and by loving example, and so we know his words to be true. We have seen his power and we have experienced his love. For this reason we follow him and in our grief we come here to this mountain that he might teach us, that he might comfort us, that he might give us peace. Jesus sets before us today the characteristics of one who seeks to follow him and so share in his glory. All who follow Christ are called to conform their lives to his, to share not only in his death but also in his Resurrection. We see in the Beatitudes the example of Jesus, for it was he who became poor for us; it was he who mourned for Jerusalem; it was he who showed us the beauty of being meek; it was he who spent countless days fasting for us; it was he who brought the infinite riches of the mercy and love of the Father for us through his death on the cross. He calls us now to follow him in all things and, having done so, we, too, “will be called children of God” and we will be united with him in Christ (Matthew 5:9; cf. Romans 8:39). His children are born from the waters that flow from the pierced side of Christ. Entering into the sacred waters, all who are baptized die with Christ and rise with him in newness of life, receiving the promise of the resurrection of the body on the last day by which they will share in his immortality, in his freedom from time, in his eternal life. This is the joy that cannot be taken away from us, that does not diminish. It is the joy of being loved by God, a love from which the just cannot be separated (cf. Romans 8:37-39). Today, then, we have come to entrust our sister, Jeanne, to the Lord, to ask him to fulfill the promise of eternal life given to her in Baptism. We pray that she may be plunged into that ocean of infinite love and know nothing but joy and gladness. This is the life promised to those who conform themselves to Christ Jesus, to him “who died, rather, was raised, who also is at the right hand of God, who indeed interceded for us” (Romans 8:35). May she be at peace this day and abide with the Lord in love (cf. Wisdom 3:). Amen. Pope Benedict XVI, Spe salvi, 10). Saint Ambrose of Milan, De excessu fratris sui Satyri, II, 47. Cf. J.R.R. Tolkien, Letter to Milton Waldman, 1951. In The Letters of J.R.R. Tolkien: A Selection Edited by Humphrey Carpenter with the Assistance of Christopher Tolkien (Boston: Houghton Mifflin Company, 2000), 147. J.R.R. Tolkien, Letter to C. Oubuter, 10 April 1958. In ibid., 267. Pope Benedict XVI, Spe salvi, 12. The "Hobby Lobby case": What's it really about?